There is a predicted Level 2 for the rest of this day, a Level 3 expected tomorrow and a Level 1 expected Saturday. Meanwhile there are three Active Regions on the solar surface--2599, 2600 and 2602. Level 3 effects can include false alarms being triggered on some protection devices. Thankfully, the main area of impact probably will be latitudes much further north than Baton Rouge. These viewings have no admission fee and are open to all ages. I used a solar viewer and saw nothing. Hayley, Amy, Roz, Apprentice Taylor and I also used the SunSpotter and 10" Dob (me between 1:01pm and 1:07pm CDT). With the Spotter I saw the largest component of AR 6203, and I saw the region's two largest components with the Dob. The only other active region on our side of the Sun (6302) had some plage but no spots, and at any rate is about to rotate out of view. There is now one active region (2615), but the relatively brief G1 watch of this week has been expanded through Friday. Earlier today I would have checked the visual accessibility of 2615, but there is seventy-five percent cloud cover forecast now and it's been that way most of the day. 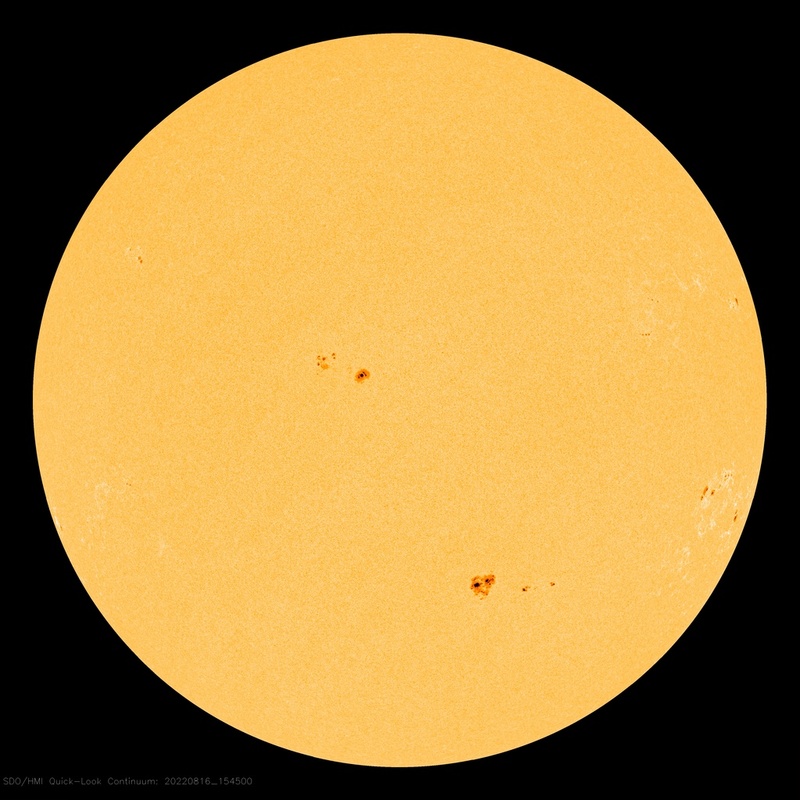 There is a sole active region at this time on the Earth-facing side of the Sun, but it has little visual activity and doesn't warrant any look except for maybe a glance with a solar viewer (which probably won't show anything). G2 conditions began at 10:13am CST. There is a single Active Region facing us--AR 2620; it's a modest sunspot with what looks like eight little-to-tiny companions. This situation would usually warrant an observing alert to BRAS members, but the sky is overcast at this time so I couldn't attempt viewing myself.